The R.L. Winston Rod Company is delighted to announce that Annette McLean has been promoted to Vice President of Operations and Rod Design. As a 25-year veteran of the Winston Rod Co., McLean has supervised every stage of the rod manufacturing and design process. She has overseen all rod production departments at Winston including boron and graphite rod building, reel seat production and bamboo rod building. In addition, Annette now oversees all aspects of Winston’s new rod design initiatives utilizing Boron III. As Vice President of Operations and Rod Design, McLean’s responsibilities have been expanded to include oversight of all of the aforementioned duties, including all manufacturing, design, quality control and other Winston production and internal operations. Since 1985, McLean has been a respected leader, not only within the company, but throughout the fly fishing industry. She is an outstanding angler and fly caster, has fished from Alaska to Florida and has conducted fly casting clinics for both men and women McLean has served on the boards of the Lewis & Clark Trout Unlimited Chapter in Southwest Montana and on the International Women’s Fly Fishing Organization. The R.L. 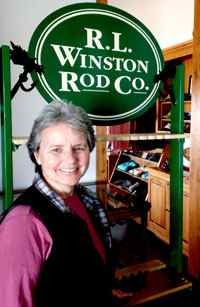 Winston Rod Company (winstonrods.com) is leading manufacturer of premium fly rods sold exclusively through the best fly shops in the world. Winston rods are manufactured under the following trademarked products: Boron III, Boron III-SX, Boron IIIx, Boron IIt, Boron II-MX, GVX-Select, VSL and Passport. Winston is located in Twin Bridges, Montana and was founded in 1929.